Sandeep Garg & Company (SGNCO) provides inspection and certification solutions that help companies manage risks, and improve performance and reputation by targeting a number of quality concerns over a period of time. Brand reputation is a priority for a business to sustain and grow, and the quality of products a company provides is directly linked to its reputation. There are many instances during a business’s lifecycle where it is faced with the challenge of quality assurance issues that can go a long way in tarnishing its reputation. To address and mitigate such quality assurance issues, Sandeep Garg & Company (SGNCO) has developed a range of metal scrap inspection and certification services designed to help metal scrap suppliers mitigate potential quality risks. SGNCO is one of the eminent pre-shipment inspection companies authorized by the DGFT (Directorate General of Foreign Trade) to offer metal scrap inspection and certification services. The certification process typically includes standardized testing and inspections carried out by the DGFT inspection agencies in a DGFT prescribed format. The pre-shipment inspection certificate format assures that uniformity in quality is maintained throughout the metal scrap consignments. Once a certificate has been delivered by SGNCO, the certification can be maintained through regular audits. The certification covers assurance related issues with products and their components, services, employees and systems. As per the Public Notice No 12/2015-20 issued by the Indian government, all metallic un-shredded and shredded scrap has to be quality assured through a compulsory Pre-Shipment Inspection and hold a pre-shipment inspection certificate in DGFT format. This pre-shipment inspection certificate issued for Indian shipments is mandatory to ensure that the metal scrap is free from any radioactive material, radiation explosive material. SGNCO is authorized to provide pre-shipment inspection certificate by DGFT. The company provides the entire range of pre-shipment inspection services to help clients mitigate any potential quality risks that may come up in their metal scrap shipments. This Pre-Shipment Inspection includes inspection of metal scrap along with associated metal scrap testing services before shipment of the cargo. The Pre-shipment inspection certificates provided by SGNCO help the clients meet the crucial challenges of quality, environmental safety, and social responsibility. Businesses across the globe rely on providing products and services to one another that should meet the prescribed standards of quality. In transit through long distances, certain unpredictable events - accidents, fraud, quality issues, etc. can occur, leaving a customer dissatisfied. To help raise the quality standards and mitigate quality risks, post-shipment inspection has become an integral part of the import process. A post-shipment inspection implies the critical inspection of metal scrap both qualitatively and quantitatively upon arrival at a port of entry. The metal scrap shipment is duly inspected to ensure that it is in compliance with the original purchase. 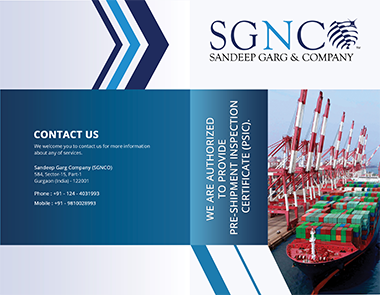 Sandeep Garg & Company (SGNCO) offers Post-shipment inspection and corresponding certification based upon certain parameters that include quantity or quality of the shipped metal scrap, transit damage or degradation, and any case of fraudulent activity while in transit. Post-shipment inspection certificates issued by SGNCO assure that the metal scrap consignments meet all standard and regulation requirements.